Get to know the Pacific Theater like never before in this special report. Yes! I’d like to buy this Pearl Harbor Special Issue! Get ready to become the next foremost authority on Pearl Harbor. You’ve likely seen In Harm’s Way, The Final Countdown and the Michael Bay movie. You’ve heard all about the USS Arizona and the Doolittle raid. But what about the role of the Philippines leading up to the Pearl Harbor attack? Or the political circumstances that made an attack from Japan all but inevitable? What about the other key players in the Pacific—Isoroku Yamamoto and Admiral Chester Nimitz—and their role in the battles that ensued? Now’s your chance to learn all about them and more with Warfare History Network’s Pearl Harbor 70th Anniversary Special Issue. Our special issue starts by challenging some of the most basic assumptions about the Pearl Harbor attack: the belief that the U.S. was caught completely unaware by Japan in Hawaii and the Philippines. As you’ll soon discover, “underprepared” is a much more accurate description. After a successful conclusion to the 1898 war with Spain, the U.S. established a small garrison army in the Philippines to occupy the subjected nation. Then in 1907, President Theodore Roosevelt further increased the American presence in the region by ordering the U.S. Navy to conduct regular patrols. Only 1,400 miles southwest of Japan, the message was clear: the U.S. intended to master the Pacific. So who were the key players in the Pearl Harbor attack? One of the most important was Isoroku Yamamoto, Commander-in-Chief of Japan’s Combined Fleet. When it came to Japan’s military strategy, he was very adamant about a pre-emptive strike against the U.S. in Hawaii. But how much do you know about Yamamoto? Did you know that he studied in the United States and held many friendships with the Americans he met there? That he was a great admirer of Abraham Lincoln, and did not want his native country to go to war against the U.S.? Inside this special issue, you’ll learn about these and other interesting facts about Yamamoto that you never get to learn from the movies. What about Admiral Chester Nimitz, Commander of the U.S. Pacific Fleet? With thousands of ships and aircraft and millions of men under his command, he was given the biggest job held by any officer in U.S. naval history. Scores of biographies have been written about him and his exploits, but what do you know about his key staffer, Captain Edwin Thomas Layton? Inside this special issue, you’ll learn how critical this young intelligence officer became to the war in the Pacific. 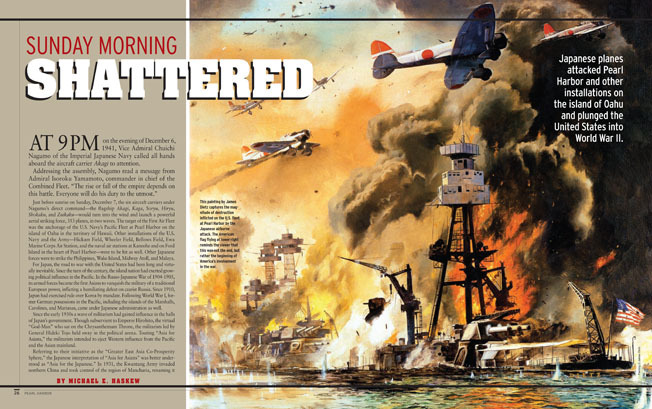 “Sunday Morning Shattered,” which gives you unique insight into how the island of Oahu weathered the attack on December 7, 1941 that plunged the U.S. into World War II. 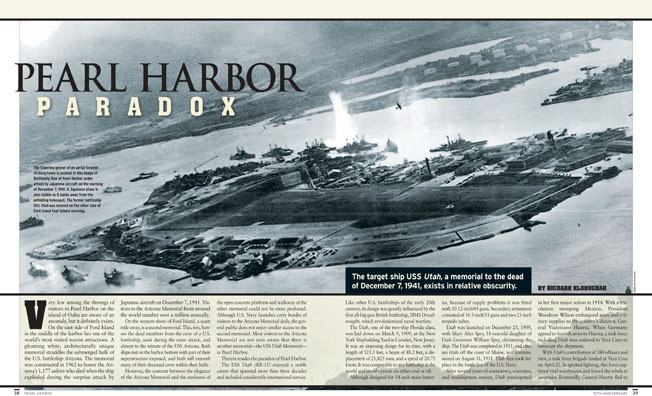 “Pearl Harbor Paradox,” which covers the target ship USS Utah, its memorial to those who died on December 7, and why it exists in relative obscurity. “Scout Squadron at Pearl Harbor,” a compelling story about the 18 dive-bombers from the carrier USS Enterprise, and their plunge straight into a Japanese attack. “Caught on the Ground,” which outlines how U.S. forces in the Philippines felt the brunt of Japanese military might on December 8. “Pearl Harbor: A Reassessment of the Japanese Way of War,” which provides new insight into the political prelude to Pearl Harbor, the Japanese way of war and how the surprise attack against the U.S. instigated a future disaster. “A Magnitude Never Imagined,” which brings you right into the salvage operations that followed the raid, and the skill, bravery and ingenuity of those who took part. “Heroic Defense of Hong Kong,” an intriguing article about the unique assemblage of Canadian, Scottish, Indian and British troops who made the Japanese pay dearly for the crown colony’s capture. “The Fight for Wake,” a riveting feature covering the opening days of the war, and how the heroic defense of this small Pacific island gave America some hope for the outcome of the war. It’s all included in your 70th Anniversary Pearl Harbor Special for just $10. From famous admirals to the men on the ground, from the USS Utah’s final minutes to the onslaughts in the Philippines, your personal guide to the Day of Infamy is just one click away. Are you ready to be the next foremost authority on Pearl Harbor? Then order your 70th Anniversary special issue today! P.S. Have you ever wondered how the war would have changed if the U.S. had actually used its B-17s against Japanese airfields immediately after Pearl Harbor? These and plenty more questions are answered inside, so grab your copy today!